Attention Elk Grove fast food connoisseurs - if you miss the various incarnations of KFC's acclaimed Double Down sandwiches, hold on to your paper napkins, Carl's Jr. has just upped the ante! In a major announcement today, CKE, parent company of Carl's Jr. and Hardee's fast food restaurants, have released details of their latest creation - the Baby Back Rib Burger. Promoted as the "Greatest American Burger Ever," the creation will be rolled out in limited national distribution on April 26. “Recently, we set out to reclaim our rightful status as ‘Pioneers of the Great American Burger,’ so we had to show the world that we’re back with a burger that truly earned a place on that mantle,” Brad Haley, chief marketing officer for Carl’s Jr. and Hardee’s said. 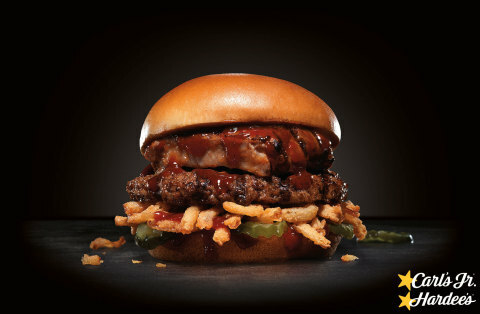 “We’ve pioneered many iconic burgers over the years, but no other chain has ever before put real, boneless, baby back ribs on a charbroiled burger and, with some crispy onion strings, pickles and BBQ sauce on it, it’s a combination that tastes amazing together." As part of the new burger, CKE has partnered with Bubba’s-Q™ Boneless Ribs (“Bubba’s-Q”), an Ohio-based BBQ restaurant and online store owned and operated by former Detroit Lions’ football defensive star Al “Bubba” Baker. The company drew national attention after appearing on a 2013 episode of ABC’s hit television program “Shark Tank,” when “Shark“ Daymond John made a deal with Bubba to invest in the brand. The Baby Back Rib Burger is available as a single patty burger, a double burger patty, and as a 100 percent Black Angus beef, 1/3-lb. Thickburger, all of which can be ordered as a combo meal with fries and a drink. Prices may vary by location. Carl's Jr. operates five outlets in Elk Grove.